Charizard is the iconic Fire- and Flying-type Pokémon. Its scorching fiery breath can melt anything in its path. Charizard is known to fly around the sky in search of powerful opponents. However, it never turns its fire on opponents weaker than itself. 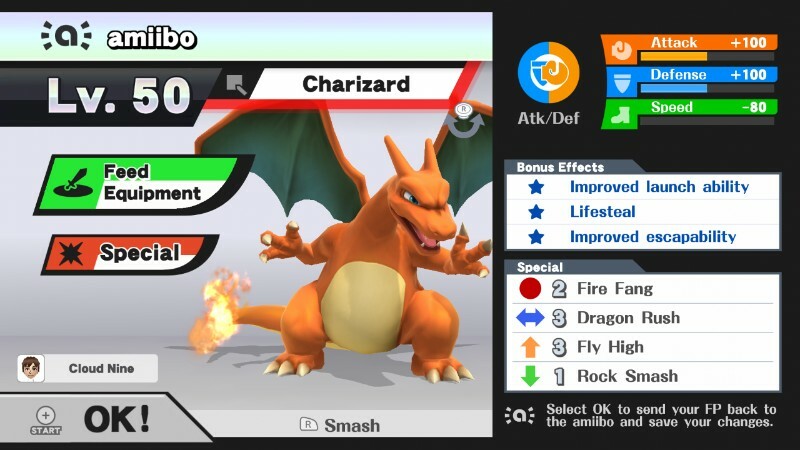 Charizard is a popular choice in competitive amiibo play, and for good reason: its attack power and durability are among the highest in the game. The Flame Pokémon also packs a useful set of smash attacks, including a forward smash that renders it intangible. 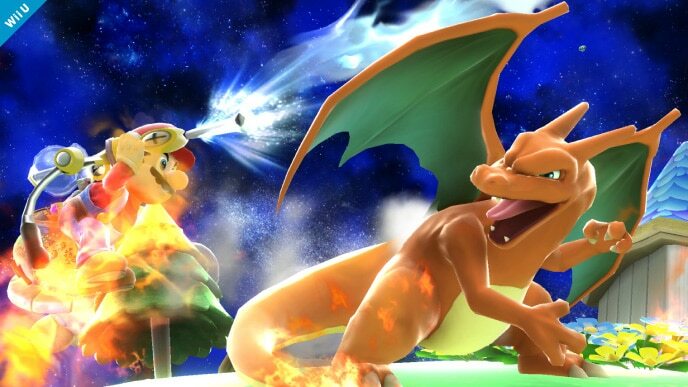 Charizard’s jab is one of the best available – its blend of power and speed makes for a great get-off-me move. Its special moves come in handy as well, with Dragon Rush (a side special custom move) greatly aiding its recovery. However, Charizard is held back somewhat by an array of flaws. The speed of its moves (bar jab) is below average, meaning that its attacks must be timed and space perfectly – otherwise, Charizard is left vulnerable. Its large frame also makes it easy to hit and an optimal target for multi-hit moves like Ness’ PK Fire. Finally, Charizard’s AI has a few strange tendencies – it’s a bit jumpy, uses its up special on stage at random, and may learn to over-rely on its down smash. Charizard is a menace on the amiibo battlefield. Its deadly strength, great longevity, and tough-to-intercept recovery make it a top-tier threat. If you’re willing to put up with some minor AI quirks, then Charizard is the Pokémon for you! Fire Fang: This is a custom move version of Charizard’s neutral special. Instead of attacking with a long stream of fire, Charizard will use a short-ranged spurt of flames that deals repeating damage. Charizard overuses its default Flamethrower at times, and this custom move version fixes this issue. While not vital to your amiibo’s success, it is an alternative worth looking into. Dragon Rush: This is a custom move version of Charizard’s side special. It is a direct upgrade to the default Flare Blitz, functioning as a safe recovery move. Charizard won’t take any damage from using the move, and will not stop flying after hitting an opponent. Fly High: This is a custom move version of Charizard’s up special, and another direct move upgrade. Fly High has increased distance compared to the default, but deals no damage. Dealing no damage is no problem because it discourages Charizard from using the move at random. Neutral options: jab, forward tilt, and down tilt. Charizard can quickly rack up damage on unsuspecting opponents. Its jab is its fastest move available, and deals a lot of damage for being a neutral attack. Forward tilt has a lot of range as well as a sweetspot on the tip of its tail. Down tilt is faster than forward tilt, but has less range. Main KO moves: forward smash, up smash, and down smash. Forward smash is Charizard’s most reliable KO move – it grants it intangibility, meaning that it can’t take any damage or knockback while using it. Unfortunately, it suffers from high ending lag, so use this move with proper timing. 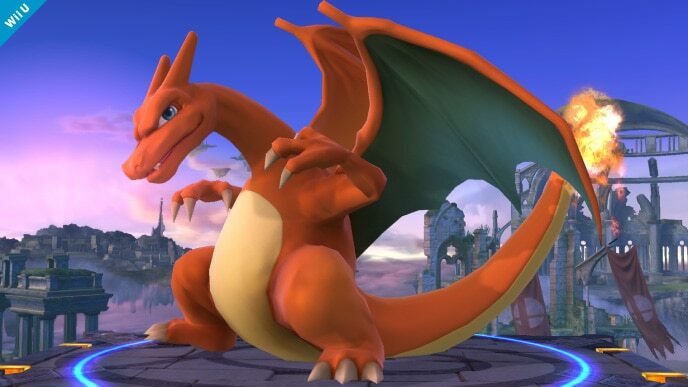 Charizard’s up smash is a great aerial punish and strikes multiple times. Down smash is faster and has less ending lag, hits on both sides, and can even catch recovering opponents, but is much weaker in exchange. Moves to avoid: neutral special. Fire Fang can be seen as a decent edge-guarding tool, but Charizard’s amiibo AI has a tendency to use this attack too often. It’s best to shelf this attack during your training. Situational moves: Dragon Rush and Rock Smash. Dragon Rush is a powerful move, and aids in Charizard’s recovery – but it’s best if you limit your use of this move. Rock Smash might not seem like an important move on paper, but your Charizard amiibo may choose to use it during a vital situation – for example, its super armor allows it to interrupt Marth’s Dancing Blade. That being said, you don’t want your Charizard to overuse this attack, as there are better moves for it to focus on. Utilize up throw as a secondary KO move. 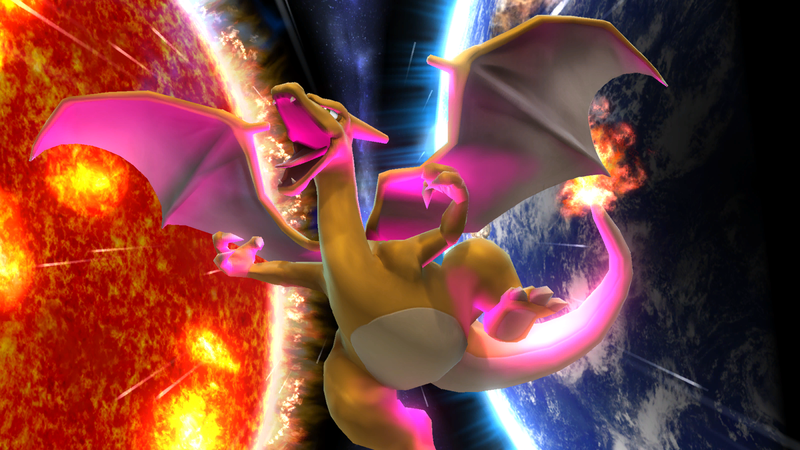 Charizard’s up throw is quite strong, and can net early KOs on stages with low ceilings. Battlefield, in particular, is a great stage with which you can utilize up throw to its fullest extent. Thanks to Blue for compiling Charizard’s information. Images are courtesy of SmashWiki and the official Super Smash Bros. website.